Boris Johnson has called on Theresa May to stop “dithering” and tell the EU that Britain will not accept the controversial backstop arrangement designed to avoid a hard border in Ireland. The former foreign secretary dismissed calls for the Prime Minister to rule out a no-deal Brexit, insisting it was “overwhelmingly likely” Brussels will offer an improved agreement following the crushing defeat of Mrs May’s plan in Parliament. Speaking as Mrs May continued intensive discussions to draw up a Plan B to be unveiled on Monday, Mr Johnson insisted that the UK must go ahead with EU withdrawal on March 29, insisting it would be “shameful” to seek to delay Brexit by asking for an extension of the Article 50 negotiation process. The Prime Minister was meeting Cabinet ministers individually and in groups at 10 Downing Street to discuss talks she has held over the past two days with opposition party leaders and MPs from all sides of the Brexit debate. After surviving a no-confidence vote in the Commons on Wednesday, Mrs May spoke with all party leaders except Jeremy Corbyn, who snubbed the talks because the PM refused to rule out no deal. She also spoke by phone on Thursday evening with German Chancellor Angela Merkel and Dutch Prime Minister Mark Rutte. A spokesman for the European Commission said that president Jean-Claude Juncker expected to speak to Mrs May, at her request, on Friday afternoon. Following reports of civil servants being asked to draw up contingency plans for an early general election, a Downing Street spokeswoman said that Mrs May was ruling out a snap poll. Mr Johnson declined to say whether he would back Mrs May to lead the Tories into an election if one was called. The former figurehead of the Vote Leave campaign sought to distance himself from controversial adverts about immigration from Turkey during the 2016 campaign. Vote Leave adverts posted widely on social media stated that “Turkey (population 76 million) is joining the EU” and “Britain’s new border is with Syria and Iraq”. Some included maps with large red arrows pointing towards the UK. He said he had always made clear that immigration “can be a wonderful thing”, so long as it is “controlled”. He called on the Government to “fire up the engines, stop dithering, emulate the spirit of JCB and remove from our path the backstop that is the last Brussels-built blockage in the path of a global Britain”. Mr Johnson said the “unprecedented” 230-vote defeat of the Withdrawal Agreement on Tuesday had given Mrs May a “mandate” to go back to Brussels and say that the UK does not accept the backstop. He said she should demand a new agreement, retaining the 21-month transition period following March 29, during which he said tariff-free trade should continue. He said that this time should be used to negotiate a free trade deal, with the UK withholding half of its £39 billion financial settlement until it is completed, in order to “put a tiger in the tank” of talks. Labour MP Virendra Sharma, a supporter of the Best for Britain campaign for a second referendum, dismissed Mr Johnson as “a helpful clown, distracting from the Government’s failures by pushing a no-deal that Parliament won’t let happen”. “It’s time to stop giving his ill-thought through ideas oxygen and hand the Brexit decision back to the public through a people’s vote,” said Mr Sharma. The comments came as International Trade Secretary Liam Fox said it is largely down to other countries to “put the work in” to ensure the UK’s free trade agreements continue to apply after a no-deal Brexit scenario. Meanwhile, Labour former minister Yvette Cooper tabled a Bill with cross-party support that would give MPs more power in the Brexit decision-making process. 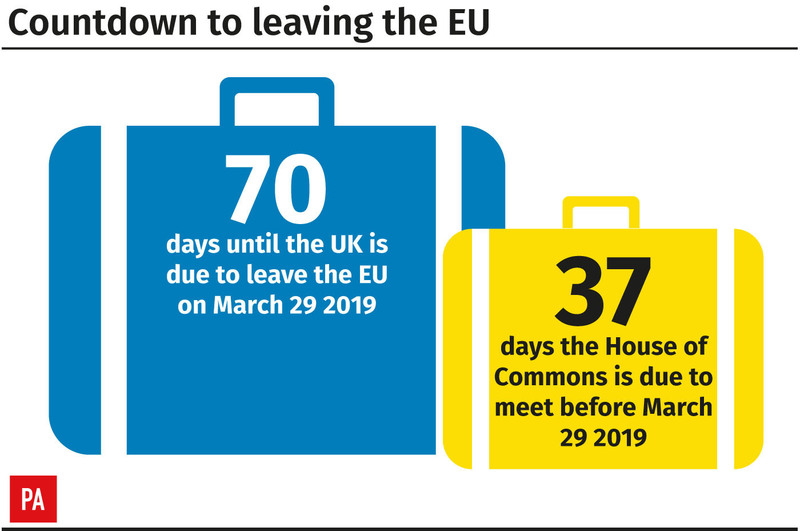 Her European Union Withdrawal (Number 3) Bill will be presented when the Commons next sits on Monday and MPs are expected to use an amendment to a Government motion to try to secure time for it to be debated in the chamber. It replaces a previous Bill by Tory Nick Boles that would allow MPs to demand an extension to the Article 50 process. Downing Street said it is “impossible” for the Government to rule out a no-deal Brexit as such a move could only be done by securing parliamentary approval or overturning the referendum result. However, the Daily Telegraph reported that up to 20 middle-ranking ministers could resign unless they are given a free vote on a backbench bid to rule out no-deal. According to the Guardian, Mr Corbyn faces up to a dozen resignations from his front bench if he comes out in favour of a second Brexit referendum.